Jinsei is a modern, upscale Japanese Sushi bar located in the heart of downtown Homewood. High-quality sushi selections and a hip atmosphere secure the restaurant's place among some of the trendiest spots for locals and visitors alike. Jinsei is a modern, upscale sushi bar known as one of the Birmingham area’s trendiest spots for Japanese cuisine. The atmosphere at this downtown Homewood restaurant is hip, and the top-quality fish is flown in daily from around the country. The menu offers a wide variety of sushi options, including Kadoma Tuna, Jinsei’s signature dish. It is easily the most popular item on the menu. 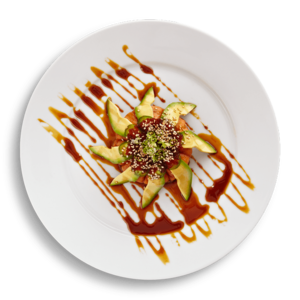 A cold dish, Kadoma Tuna consists of spicy tuna, a tempura rice cake, avocado, jalapeño, tobiko (flying fish roe) and eel sauce. The dish is prepared by deep frying rice in a disk and letting it cool to room temperature. It is then topped with tuna, thin slices of avocado, fresh jalapeño and roe. The combination of fresh ingredients and unique flavors makes Kadoma Tuna a winner.